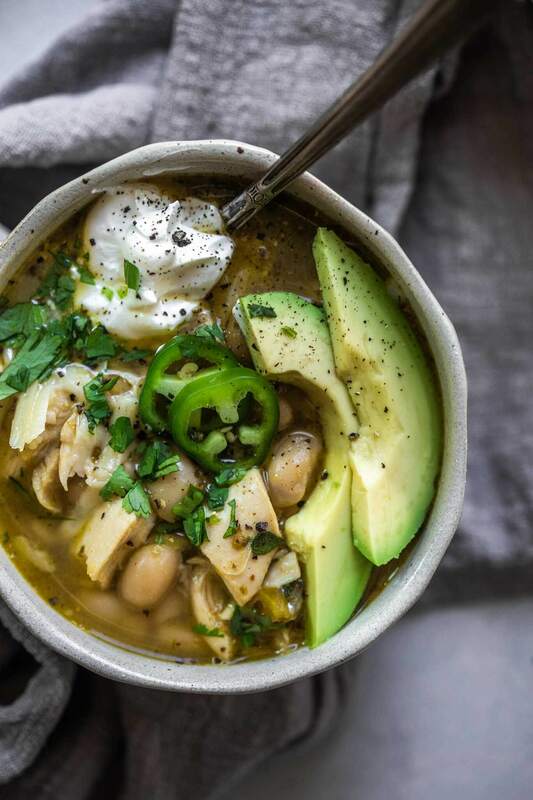 This Easy White Chicken Chili can be made in under 30-minutes. Spicy and smoky it’s made with chicken, white beans, jalapenos, mild green chilis and plenty of monterey jack cheese. 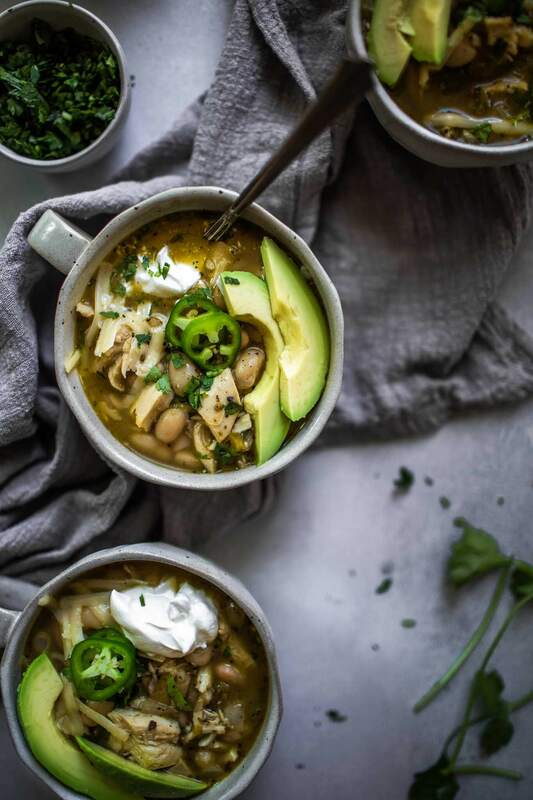 It’s a delicious, creamy white chicken chili that perfect for cozy nights at home. 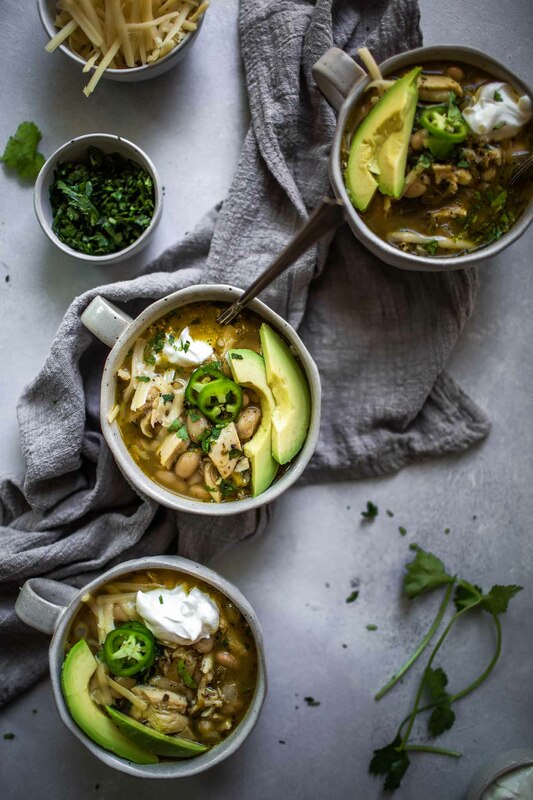 Easy White Chicken Chili is a favorite of mine. 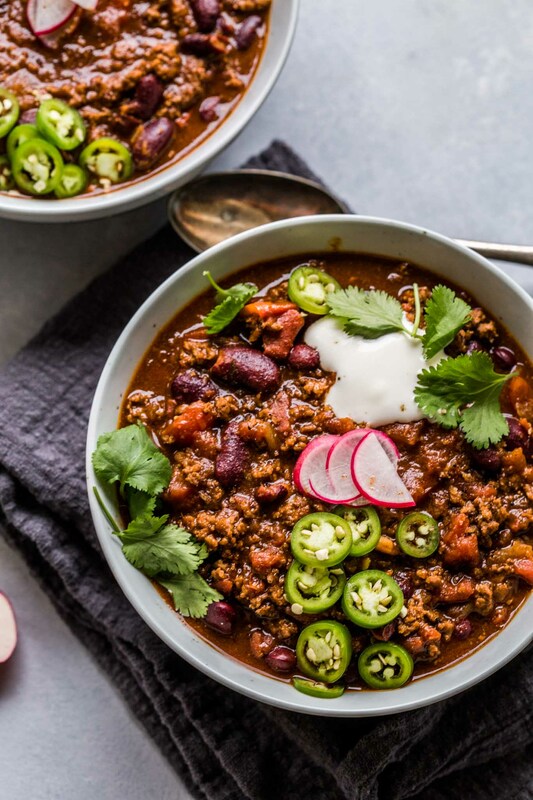 I’m a huge fan of chili for the mere fact that you can cook up a big batch and then have it for lunch throughout the week. Chili is quick to throw together and, in my opinion, it’s always better the second day! As I do with many of my chili recipes, I like to throw in a splash of beer for good measure (plus, it doesn’t hurt that I get to finish off the can). I do the same thing for this Buffalo Chicken Chili. For this batch of chicken chili, I used the remnants from this roasted chicken. A small chicken makes just enough for my husband and I to have dinner one night, and then fix a pot of chili the next. You could also grab a pre-cooked rotisserie chicken from your local grocery store, or, just boil a couple of chicken breasts until they’re cooked, and then shred with a fork. Is White Chicken Chili Spicy? This chili has got a bit of a kick with the addition of jalapenos. If you prefer things a bit milder, go ahead and omit the jalapenos and just use two cans of green chile peppers instead. What Spices Go In White Chicken Chili? Add in your usual chili seasonings of cumin (my favorite spice! ), oregano and cayenne, and then let it all simmer for about 15 minutes. If you loved this Easy White Chicken Chili I would appreciate it so much if you would give this recipe a star review! Also, be sure to snap a picture of your finished dish and share it with me onInstagram using the hashtag #platingsandpairings and tagging me @platingsandpairings. 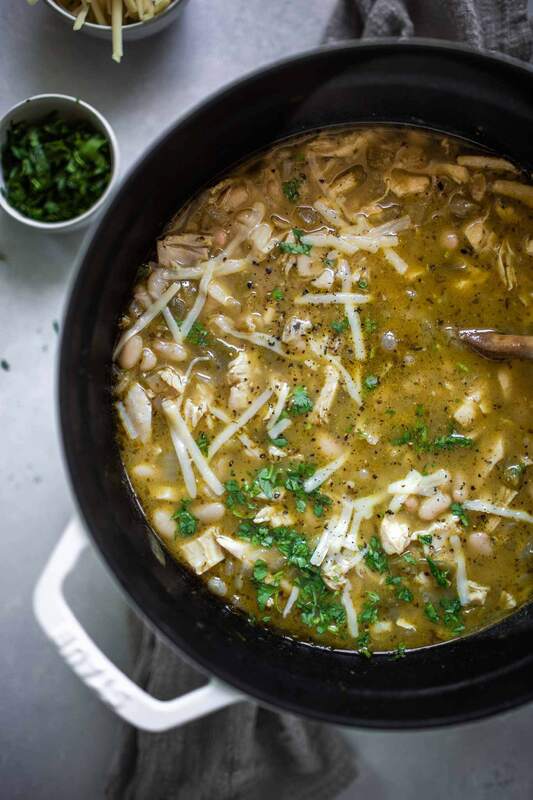 This Easy White Chicken Chili can be made in under 30-minutes. Spicy and smoky it's made with chicken, white beans, jalapenos, mild green chilis and plenty of monterey jack cheese. 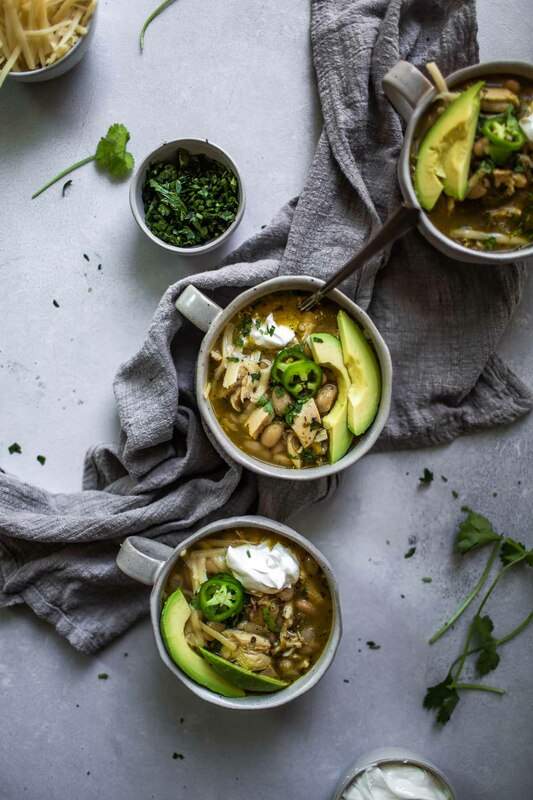 It's a delicious, creamy white chicken chili that perfect for cozy nights at home. Heat the oil in a large saucepan over medium-high heat. Add the onion, and cook until softened, 4-5 minutes. Mix in the garlic, jalapenos, chiles, cumin, oregano and cayenne. Continue to cook for 2-3 minutes. Add the chicken, beans, broth and beer and chicken broth. Bring to a boil and simmer, uncovered, 15 minutes, stirring occasionally. Remove the mixture from heat. Stir in the cheese until melted. Serve topped with chopped cilantro, sour cream and avocado. The first thing I normally reach for to pair with chili is a beer. But, if you’re looking for a wine pairing with your chili, I’d suggest a non-oaked, light bodied white. 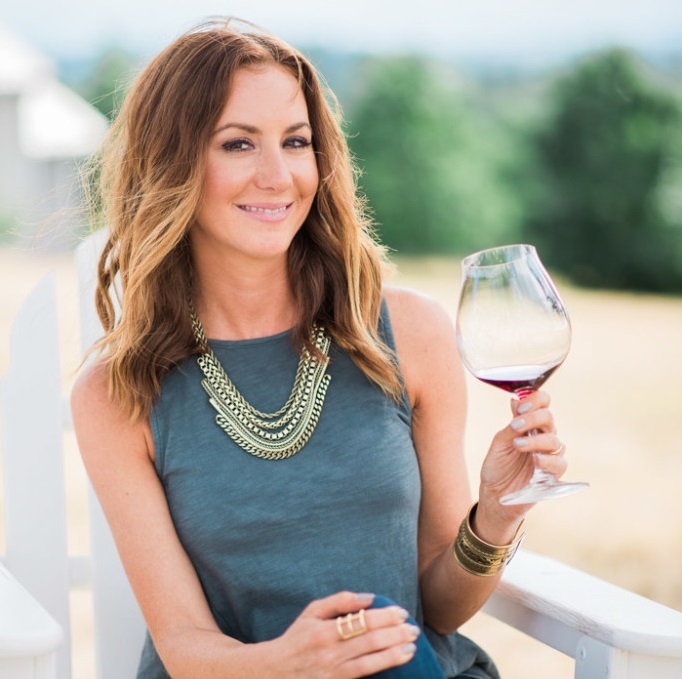 Try a dry Riesling or Pinot Gris. Looking for a traditional chili recipe? Be sure to try my Spicy Beef & Beer Chili. Annie – Hopefully it warms up for you soon!!! I’m originally from the upstate NY area and DO NOT miss the cold!!! Looks great, my family loves a good chili recipe! What a great recipe! It’s finally turned cold here in NYC so I am researching the heck out of Chili recipes and this is one of the most unusual I’ve found. Can’t wait to try it. How would you suggest to cook in a crock pot? I would start with uncooked chicken breasts, instead of the pre-cooked shredded chicken. Add all ingredients (except for cheese) to a crock pot, and cook on low for 6-8 hours. Stir. If the chicken hasn’t already shredded with the stirring, go ahead and use two forks to shred the meat. Stir in the cheese until melted, and serve. Kristina – Corn would be AMAZING in this! I would add 1 cup of frozen corn right before the simmering process. Fresh corn and canned corn would work as well. Hope this helps! I’d love to hear back on how it turns out! Any ideas on sides for this dish? I am serving this tomorrow for some guests and would like another side or two to even out the meal, but am stumped on what else to make. Thanks! Hi Emma – I would serve up some cornbread and maybe this salad on the side. 3 (what#? )ounce cans great northern beans?? Hi – It should be 3-15 ounce cans. Sorry for the confusion! White chili is one of my favorites and the recipe I use is almost identicle but includes lime juice and doesn’t include beer. Love the addition of lime juice Alexis! Sounds and looks incredibly good! Am always looking for new recipes to make easily. Will definitely be try it. Sounds delicious! 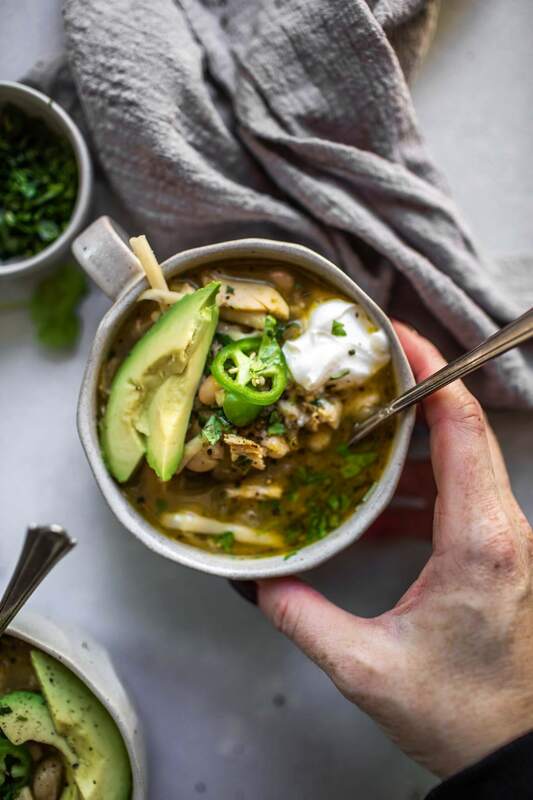 I love white bean chicken chili! I like to use 2 cans of white beans and replace the third can with refried beans. This gives the broth a more creamy texture. I also add a chopped bell pepper and three teasps. chili powder. Yummy! I love those substitution ideas Connie! I have looked for awhile for a good white bean / chicken chili recipe. This one is REALLY delicious! I ran out of cumin so added some chili powder. I only had Colby jack cheese on hand so used that. No matter. It was really fabulous. Can’t wait to make it again. It was easy although a good bit of chopping and shredding. But worth it. Great dish.